Why do plants grow toward light? We all have seen plants that grow at drastic angles or around poles, but why does this occur? 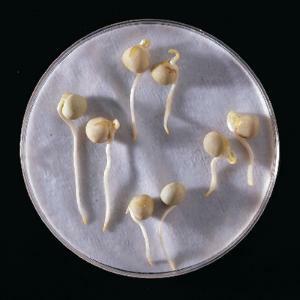 In this activity, students observe different types of tropic responses, such as geotropism, phototropism, and thigmotropism, as they use different stimuli to change the direction in which a plant grows. While employing the basic framework principles of Ecosystems (LS2) and Biological Evolution (LS4), students learn what part of a plant is responsible for each tropism and view the natural movement from germination to seedling to growth. They also observe how plants orient themselves to light and other environmental conditions as they grow. This kit aligns with all published National Standards. Pre and post-laboratory assessments and vocabulary words target specific Science and Engineering Practices and Common Core standards. The teacher guide also contains specific "Did You Know" concepts that link the real world with the scientific standards explored. This kit includes a student copymaster and enough materials for six setups. 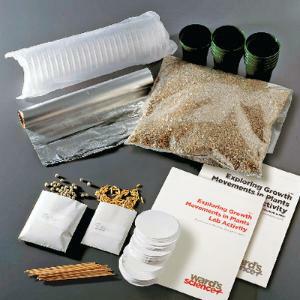 Ordering information: This lab includes pea seeds, oat seed, plastic pots, vermiculite, petri dishes, filter paper, wooden stakes, and aluminum foil. A light source and scissors are required but not included. A laboratory stand and laboratory clamp are optional.